For many people, the process of psychotherapy is mysterious. This post will attempt to make it less so – by highlighting key features it shares with the practice of physiotherapy. As part of their initial assessment, physiotherapists will tend to ask three basic questions: 1) How/where do you feel pain/weakness? 2) How/where do you notice restriction in movement, and 3) When did these problems start, and what were the circumstances surrounding them? The answers to the first two questions allow the physiotherapist to note the problems that their patient wants to resolve (e.g. “to be able to lift without pain”), as well as providing diagnostic clues about the underlying cause. A ‘pins and needles’ sensation in the arm, for example, may indicate nerve impingement at the shoulder. The last question will give additional clues to help formulate a diagnostic hypothesis. With their patient’s list of presenting symptoms and concerns, and a theoretical framework to make sense of them (i.e. understanding of nerve and musculoskeletal systems), the physiotherapist considers some tentative hypotheses. The initial assessment of a psychologist follows a similar line of questioning. The therapist wants to know how the patient experiences emotional or physical pain: Is it sadness, grief, or anger? Do they experience tension headaches, nausea, or panic attacks? Does the patient experience psychological restriction (e.g. “I haven’t cried in years,” “I don’t feel normal/happy”), or restriction in relationships (e.g. “I cannot trust people,” “I don’t’ open up with others,” or “my anger pushes people away”). The therapist will ask if the client considers these issues problematic, and if they wish to make them targeted goals for therapy. Finally, questions about the onset of these issues will give clues as to their underlying cause; filtered through a psychological theory (e.g. psychodynamic, CBT, interpersonal, existential), the psychologist entertains a few tentative hypotheses. Good therapists will not commit to a diagnosis until they have direct experience working with the patient, and a chance to observe their difficulties. 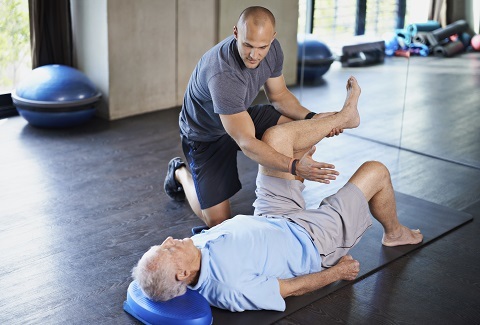 A physiotherapist will palpate a muscle or joint for abnormalities, and will ask the patient to engage in functional movement to observe musculoskeletal form, while the patient notifies of symptomatic change. Where is the pain? Where are the restrictions? What unhealthy movement patterns compensate for the restriction? A psychologist will similarly test competing hypotheses through directly engaging with their client. But instead of palpating a muscle, the therapist will prod with a series of questions, while paying close attention to the responses. The psychologist is not testing musculoskeletal range of motion, but psychological range and restriction, by paying close attention to symptomatic changes in session. Take for example, a man who arrives to a psychotherapy appointment due to recurring panic attacks. Upon questioning, the therapist learns that the man’s symptoms started six months ago, after being demoted by his boss. The psychologist asks how the man felt about it, and notices that the man avoids discussing the topic, and becomes physically tense (e.g. he starts tapping his foot and clenches his hands). The psychologist invites the client again to briefly explore the topic, and the client once more displays signs of anxiety. This is the equivalent of a physiotherapy client experiencing pain when asked to perform a range of motion test. The main difference being that physiotherapist patients are more aware of their pain, whereas psychological issues have a way of concealing themselves from the persons burdened by them. After a period of testing, both the psychologist and physiotherapist will finally commit themselves to the most sensible hypothesis. They will usually present this to the client for confirmation, and will formulate a collaborative treatment plan to resolve it. When nudging the patient to engage in certain movements (or conversations) we notice biomechanical or psychological workarounds that have compensated for the physical (or emotional) restriction. We ask the patient the consequence of these restrictions (“I can’t bend over” or “I avoid social situations that make me anxious”), and get permission to mobilize them. In physiotherapy, this might involve deep tissue mobilization, which naturally causes some short-term discomfort. In psychotherapy, this usually involves physical tension or anxiety. As a consumer of some top-level physiotherapy, I can tell you that the good stuff hurts a little in the moment, but feels great in the following days. Psychotherapy clients similarly report leaving some of our heavier sessions feeling exhausted – though afterward feeling much better and less restricted. After several sessions, friends and family members may even comment on how they seem different. I am of course drawing a parallel here to illustrate that both kinds of therapy are prone to causing short-term pain. Imagine, for example, a physiotherapist or massage therapist with a gentle touch. Nothing is getting mobilized, nothing is going to change. Likewise, consider a psychotherapist who allows their patient to come into each session and just talk – with no re-direction, no challenge, and no pressure to mobilize. Nothing significant will happen. Consider a more harsh comparison: you go to a physiotherapist to help you mobilize a frozen hip because it hurts to put weight on that leg. But instead, they give you a crutch so you never have to bear weight on it. This may sound absurd, but I think some psychotherapists unintentionally offer the psychological equivalent. Instead of pushing themselves and their clients to resolve the real issue, they instead offer a psychological crutch to help them cope with their symptoms. We need to do more. I hope this comparison is able to shed light on the process of therapy. If you have questions about how our Halifax Psychologists can help you, or if you would like to book an appointment, please contact us.